Live in a Tree Stump! Money is tight for the great majority of people right now. If renting an apartment is not for you, and you want a small house for less than $40k, then chances are it’s going to be a so-called “tiny house.” These are typically 50 to 400 square feet and most often use a compost or chemical toilet (or, god forbid the smell, an incinerator toilet). Here (right) is a photo of a typical tiny house from Wikipedia. People think this is a new thing. While the reason people may be building and living in houses the size of a single room in a home may vary (“I want to downsize,” “I can make do with less,” “Who can afford a regular size house?” “My wife and kids drive me nuts!”), the fact is that people have been living in eensy-weensy domiciles for hundreds of years. I suppose we could start with the cave, and the caveman and woman, but that’s silly. They didn’t even know about toilet paper. As the first waves of loggers swept over great portions of the Pacific Northwest's old-growth forests in the second half of the nineteenth century, those men opened up the dark dense woodlands to settlement. …. Left behind was a scarred landscape, scrap wood, and stumps. Many stumps. Huge stumps. Stumps that still stood a full 10 feet high but were undesirable as lumber because they tended to swell down toward their base, making the wood-grain uneven. When subsequent waves of pioneer settlers came on through, they found those old logging sites to be welcome clearings that hinted at possible futures as rich farmland. But, being littered with debris—and those towering stumps—these homesteads presented the challenge of years' worth of hard labor just to clear (by burning and digging-out stumps) enough proper space to plant orchards or raise crops or livestock. bears. And sometimes it was people who were the denizens of these stump houses. As early as 1847 the pioneering McAllister family moved northward to the Medicine Creek area (near Nisqually). It was there that they set up shelter by hollowing out a stump and making a “Home Sweet Home” there until they could erect a proper house. After that, the structure served them as a barn. 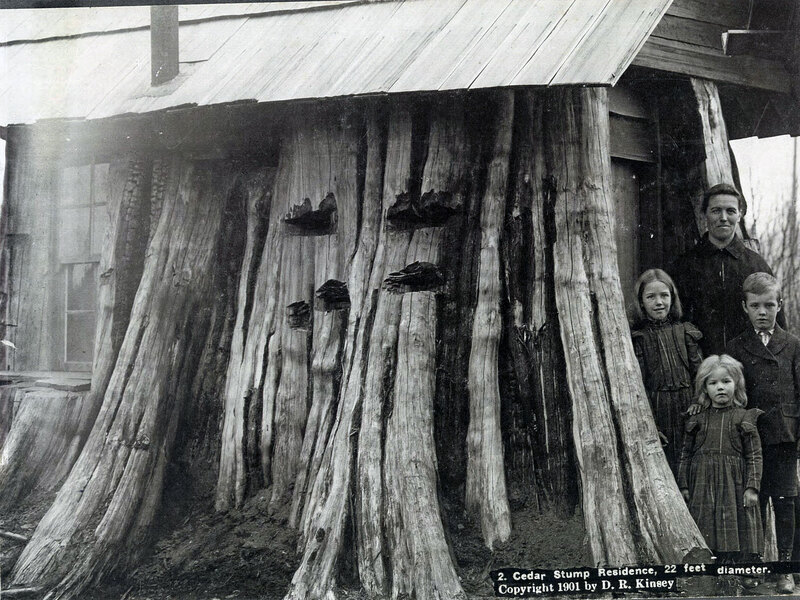 But the most famous of all local stump houses was one located on the Lennstrom family's property in Snohomish County's Stillaguamish Valley, in the tiny community of Edgecomb, which is currently a neighborhood within the old logging and railroad town of Arlington. Amazingly, a few of these stump houses still remain. So, if you have a big old massive tree stump on your property and are looking for a new private space, get your tools ready. It took one guy 20 years to carve out his stump house!